Don’t Write People Off; Draw Them in. Glen Campbell was one of my earliest crushes. I associated him with everything I thought was good about the sixties — acoustic guitar music, Aqua Velva, singing about love in public, denim and cotton. But through the lyrics of one of his songs, “Gentle on my Mind,” I realized how terrible people can be toward each other. I was four when the song came out and was maybe twice that age when the lyrics struck me. He casually sang, “And some other woman’s cryin’ to her mother/ ‘Cause she turned and I was gone.” He’s singing it to a woman who knows that his presence and the comfort she gains from it (“sleeping bag rolled up and stashed behind your couch”) comes at a cost to someone she hasn’t met, whom he had previously tenderly regarded, and whom he knows that he’s hurt. That was my wake-up for the down side of hippies and free love. They knew their choices hurt people who loved them and they didn’t care. I was young, but the moment of revelation was formative in my life changes. I wanted a man who wasn’t like that. I wanted to be a woman who didn’t do that to someone else. I decided early that I only wanted what was mine. 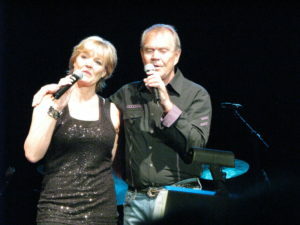 Glen Campbell must have listened to his own song. He decided to give up his hard drinking, free loving ways and became a dedicated Christian. He stopped the drugs and drinking, mostly, and served his time with a song for others when he lapsed. His last wife, Kimberly, to whom he was married longest, steadied him in his new life, even when he fell off the wagon. He said that some music friends were more frightened when he turned to Christ than when they had been when he turned to drugs. But his music had a resurgence in popularity. You can learn a lot from good music. Truth and beauty are intertwined, even when beauty reveals a truth that’s rot gut ugly. He wasn’t done teaching us, after he cleaned up his act and life. His graceful and brutally honest approach to being diagnosed with Alzheimer’s was brave and helped many who had wrangled with the disease in private. He gave it an anthem. We will miss him. We started missing him when he announced he had this disease. And he? He’s not gonna miss us.